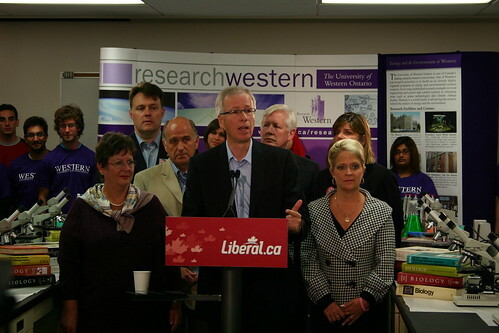 Today Stephan Dion made a campaign stop in London to announce $1.2 billion in promises for post-secondary grants, loans and research cash. 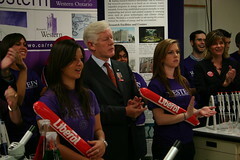 The announcement aims to ease access to post-secondary education with education grants that would be delivered four times a year, bursaries of up to $3,500 per year, a $5,000 student loan regardless of parental income; and guaranteeing a lower interest rate for student loans while extending the grace period on repayment to two years, interest-free. 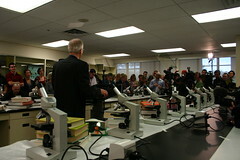 He also promised increased support of university-based research and extend tax credits to the private sector for research. 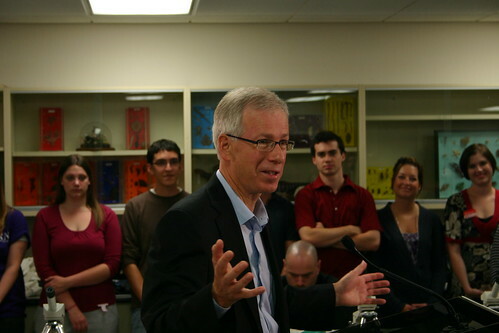 “Support for learning has been a long-standing Liberal value and under a new Liberal government we will make the investments in the post-secondary education and research needed to ensure Canada can compete in the 21st century,” said Mr. Dion. 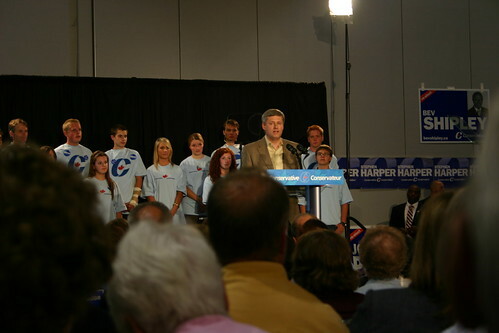 Earlier this week Steven Harper prommised Ottawa will make “prudent” investments to boost the economy of Southwestern Ontario, noting the millions his government has earmearked for the regions infrastructure, University, and manufacturing industry. He also warned the region would be adversly effected if Dion were to be elected and implients their proposed carbon tax proposal. At the time of this article being writen the NDP nore the Green Party have announced stops in London, although a staffer at Irene Mathyssen’s (London-Fanshaw) office said he would be stoping here at some point durring the campaign. Its that time of year again, its officially (ok, well not officially yet) fall and more importantly back to school time. First and foremost please remember to slow down when you see children and school buses. They are our future and we need to protect them. Drive cautiously and remember the rules of the roads. Students, some people hear that word and they just cringe. Many people when they hear this word they immediately think of Fanshawe College and UWO students who are once again “taking over” The City as they do each and every year for 8 months or so. In the past weeks there have been more articles in the local news about students and the problems they bring with them, and like every other year the stories will continue until the students leave. We hear about the ignorant students, the loud and destructive students, the students that love to party, the students that love to cause a public disturbance, we hear about the negative aspects of city life that we hear about these day after day. But have we ever stopped to think about the positive things that students bring to The City, most of us I take it have never thought of these things and I thought it were about time that we began to. By no means is this an exhausted list of the positives that students bring to London, it is only a beginning. The charity work that students contribute to London’s social well being is phenomenal. Most people will mention Shinerama at the beginning of the school year that involves students but beyond that most people are hard pressed to name any other charities or organizations that benefit from student presence. Big Brothers, Big Sisters, Community Living London, Participation House are just a few of the organizations that benefit greatly. The local school boards (TVDSB, Catholic and others) all benefit from students volunteering to help in any number of ways. Although beyond Shinerama and United Way events, the presence of students in charitable organizations may not be known, not because the students aren’t there, because believe me they are, but because students aren’t always looking for the recognition but rather they are just looking to help out. No matter what your standpoint and opinion are about the LTC and the service it provides you have to admit that without the student presence in town the service would be lacking. 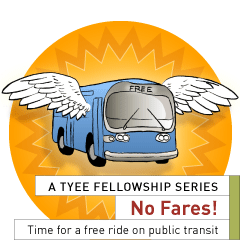 Students not only help to keep the cost of bus fair down (passes, tickets and coin) they allow London to have the number of buses that it does as well as the service coverage and service frequency. Without students tuition (portion of) subsidizing the public transit system in London, the service that we are currently receiving would be no-where near as good as it is. Students pour tons of money into the local economy here in London and without the students and their money London would not have many of the services and shops currently available to every consumer. Students allow many restaurants to stay open, students ensure that the commercial services in malls and in the downtown are able to sustain business. The services that students need allow for thousands of people in London to be employed, not only those at Fanshawe and Western but throughout the city. Businesses locate in London because there is a large student population and many would not locate otherwise, this in turn provides the rest of the population access to the same businesses and services. Students do not only bring their money (or parents money) with them but they bring business and services as well. Social Characteristics are perhaps one of the most important things that students being to The City, but one of the most overlooked. The student population (and young professional population, of whom were students some short time ago) not only bring new ideas to London but they ensure that the population in The City does not remain stagnant, that it continues to have a youthful characteristic to it. Without the students London could be labeled as a retirement comment that is slowly on the decline, with limited grow, limited income and limited financial input into the local economy. Students help to balance out the demographics, not only in London but in any city with major educational institutions. Students are the future of London. Not only are they providing the local economy with skilled workers (ok, many are leaving but this is another issue altogether) but they are providing The City with tax dollars that end up paying for services for those in their aging years. Students provide a new outlook on The City and Life, not a better outlook but a new and refreshed one. Students are the ones that in 10 years will be given the task of looking after the aging population, providing services to The City and who will be eventually running the cities. Students provide a vast number of things to London, presently and in the future. By no means am I trying to defend students as a whole, some students are better/worse than others. Students may cause disturbances, students may be ignorant, students may throw loud and annoying parties, other students may get arrested for one thing or another and students may be the worst thing to happen to this city. I think what we need to do as society is to start having a different perspective on issues such as students and those of the like. How would we react to these vary comments and allegations if we replaced the word students with other words. Natives may cause disturbances, Blacks may be ignorant, Whites may throw loud and annoying parties, Christians may get arrested for one thing or another and Canadians may be the worst thing to happen to this city. A little hard to swallow perhaps? My point exactly. My guess is that people would not be to fond of the above statements and there would be a much larger uproar. Is it really that fair to pick on students? I admit there are problem students out there, but the majority are not. With that said, how about we try to look at both the positives and negatives that the varying people of London bring to the city and stop stereotyping them into specific groups using them as scapegoats for larger issues tha may exist. Western Partners with NASA Lunar Science Institute. 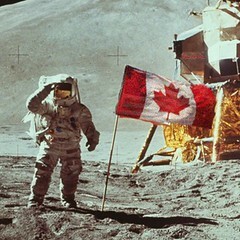 The National Aeronautics and Space Administration (NASA) said the University of Western Ontario will represent the Canadian lunar science community as the agency’s first international partner. The Lunar Institute will develop the next generation of lunar scientists, expanding research and education about the moon, and provided technical assistance for NASA’s next phase of scientific exploration of the moon. 2008/04/02 – Edmonton Journal: Will penny come a cropper? 2008/04/03 – Toronto Star: Is it time to scrap the penny? There’s an article that mentions me in the current edition of The Reporter. Should Collaborative Learning be Prohibited? A UWO Gazette sketch (reposted with permission). Have you been following the Facebook ‘cheating scandal’ story? Click on the ‘toon to read the Gazette’s editorial position. It’ll take more than 70¢/week to accumulate the $5000 that’s eligible for the feds RESP savings plan, but maybe the sharp pencils used by cartoonists are different than the ones used by accountants. In any case, what bothers me most about about the seeming largesse of this political gesture is the fact that it’s limited to education savings. Click on the ‘toon to read the editorial. Today’s Gazette editorial says: “It is unrealistic to expect a sudden conversion to a capitalist democracy, but it is fair to infer there will be a gradual loosening of regulations and more prominent liberalism in Cuba in the coming years. It is therefore safe to foresee a flourishing democracy down the road.” So far I haven’t seen any evidence to lead me to that conclusion. But perhaps they know something that I don’t. Todays Gazette editorial writer is correct. The sale of cigarettes in Mustang Alley is a moral and health issue in addition to being a business decision. But does the lack of interest by students justify the suggestion that it isn’t worth the time of the students’ council? What role does the Gazette play in an issue like this? Does today’s editorial fulfill any responsibility that it might have to educate and to promote discussion of worthy issues? It seems that there’s some discord about ‘the voice’ of Canadian university students. Today’s Gazette editorial questions the secretive tactics employed by the Canadian Federation of Students which were intended “to keep several BC schools within the CFS fold…and an alleged plan to manipulate polling stations”. Click on the sketch to read the editorial.